John Schilkowsky, a graduate of Cornell University (undergrad) and Northeastern University (graduate), joined NE Distance in June of 2017. Although John arrived at Cornell as a solid 400m/800m runner – he was a two-time NC State Champion at 800m and ran 1:52 to take 2nd in the 800m at the 2010 National Scholastic Indoor Championships – he quickly found himself moving up in distance. In his sophomore year when he ran 4:03 for the mile in only his third ever race at the distance, John’s future as a miler was solidified. His junior year saw him continue to excel as he moved up in distance. He ran 24:30 for 8k to finish as Cornell’s 5th man at the 2012 Cross Country Ivy League Championships and notched a time of 8:06 for 3000m during the following indoor season in addition to lowering his mile PR to 4:02. Though two serious injuries unfortunately kept him sidelined for most of his senior year, he still contributed to the team’s efforts as a Cross Country Captain. He went on to complete his collegiate eligibility the following year at Northeastern University where his experience and leadership played a crucial role in the young team’s success. Since joining the post-collegiate running world, John has also dabbled on the roads, once again finding success over longer distances. 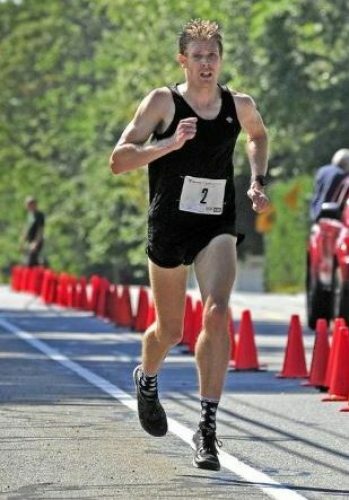 He most notably ran 14:49 and took 2nd place in the stacked 2016 Ras na heireann USA 5k, and finished 10th at the 2016 USATF-NE 10k Championships with a time of 31:30. In the spring of 2018, John returned to the track and improved during each one of his races, ultimately running a season’s best of 3:53 for 1500m. John also competes for rabbit as a member of their elite team. After earning his bachelors in Nutrition from Cornell, he went on to earn his masters in Regulatory Affairs from Northeastern. Upon graduating in December 2015, he began working for the TIMI Study group of Brigham and Women’s Hospital as a Regulatory Clinical Trial Lead. When he and wife/fellow NE Distance Elite teammate, Rachel Schilkowsky, moved to Providence in the summer of 2017, John returned to school to pursue his life-long dream of becoming a physical therapist. After successfully complete all prerequisite courses in the fall of 2017 and spring of 2018, John was accepted to the Doctor of Physical Therapy program at South College in Tennessee. That program, a hybrid one which involves eight-week didactic, online learning segments followed by three week hands-on, immersive segments in Tennessee, began in June of 2018 and will last two years.